Benedictine Appeal – Ordo Militaris, Inc.
To promote investment in our defense and security initiative, Ordo Militaris Inc., the Order is offering as a free gift, the unique collectible of a printed canvass work of art as a Memento of a most memorable Pontificate, to all who purchase at least 1 share of the common stock of Ordo Militaris Inc.. 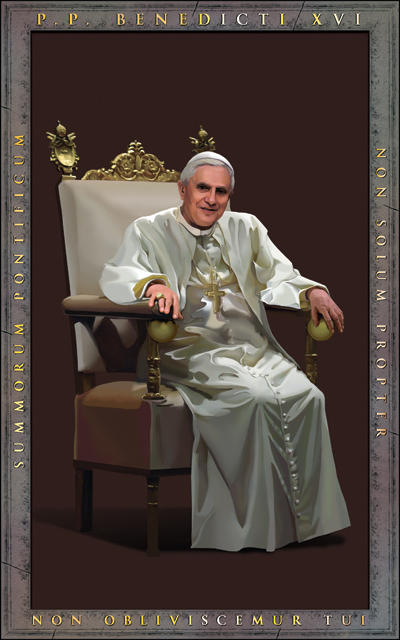 This art work was commissioned by Ordo Militaris Inc. to commemorate the pontificate which defended liturgical tradition in an extraordinary way. It is an original work of art which stylizes this great man in a uniquely creative manner, which is near life like. The Latin Inscriptions on the image recall its most famous moments: Summorum Pontificum, when the ancient liturgy’s validity was declared perpetually valid; Non solum propter, when the Pope abdicated. The Latin above and below the central image proclaims: We will not forget you! The artwork measures 20 inches wide by 30 inches tall. Its printed by a process which makes the image quasi permanent. The canvass is mounted on a subframe, so that it can be framed by the recipient in any manner they chose. This artwork is NOT for sale. You can only obtain a copy as a gift, after you purchase at least 1 share of Y or T Series Stock of our corporation. For more information on our Stock Offerings, see our Investment Page. This offer will be made ONLY to those who purchase stock in our corporation for the first time, until further notice. Please do not contact our offices to obtain this image under any other conditions.